Mini vMac 3.3.3, SDL under Linux? Post subject: Mini vMac 3.3.3, SDL under Linux? It looks to be a color depth issue, so I tried compiling it with a higher color depth. It complained that the Mac Plus only supported B&W. So I tried rebuilding it as a Mac II, and it rewarded me with a juicy seg fault. 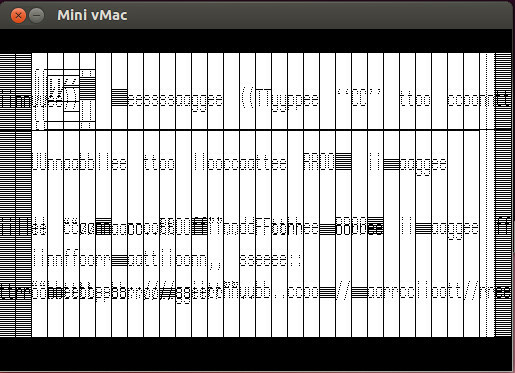 So at this point, I'm wondering whether the SDL support works at all in Mini vMac. Post subject: Re: Mini vMac 3.3.3, SDL under Linux? Paul Pratt (Mini vMac developer) visits this forum every now and then. I suspect that you could also ask him your question via the form on his site, or perhaps point him towards this topic. Does PCE really not read those disk images? I can put the files in a more usable format if you need them. Just let me know. It might also be useful for someone to update PCE so that it can use the .dsk images, as they've become a de-facto standard. The SDL port is believed to be functional, but it is true I've only tried it on OS X recently. Bug reports are welcome. I'll try it on Linux when I find time. One possible issue is that if you're running a modern version of Linux on a modern machine, it is likely you are running a 64 bit linux. In that case you should be using "-t lx64" instead "-t lx86". Normally, trying to compile the wrong version of assembly code would alert you, but you have disabled that. Did you try the standard compile without SDL (using X)? Update: I have tried "-t lx64 -api sdl -no-asm" on a VMware image I have of Ubuntu 10.04 with SDL 1.2.14. It seems to work without problems. I tried "-t lx32 -api sdl -no-asm" and as expected it didn't work, hanging with a black screen with the ROM image, and gives a "Segmentation fault" without the ROM, which matches pretty well what you describe. For the next version, I'll look into having the build system put a check for this situation in the configuration file it generates.